Mainstream economists continue to dominate their profession and wield huge influence on public policies. They merely needed to close ranks after the financial crisis and wait for people to forget that their key theories and models were wholly discredited. Meanwhile, heterodox economists who stress credit market risks and financial fragilities – the Austrians, the Minskyites – remain stuck on the fringes of the field. It doesn’t much matter that the crisis validated their thinking. There may be no better example of mainstream economists’ Machiavellian preservation of position than in the cadre of left-wing, Keynesian bloggers led by Paul Krugman. We say “led by Krugman” because he seems to set the tone and tactics that many of his cohorts mimic. If you happen to read a blog post that attacks ideological foes through a combination of ridicule, name-calling and false narratives – such as the absurd claim that all conservatives (alternatively, all Austrians) predicted rising inflation in recent years – it was probably inspired by Krugman. Readers of this blog know that we would welcome a genuine shake-up in the field. Wouldn’t it be nice to have a Colonel Jessup moment – when the code of silence breaks and everyone finally knows the truth? In other words: we want the impossible. Hollywood endings only happen in Hollywood studios. The real life Jessup would have denied the Code Red, smirked through his acquittal and caught the first flight back to Gitmo. He may have even felt the need to send a message to his troops by ordering another Code Red at the first opportunity. That’s pretty much what we’ve witnessed in the economics profession. Nonetheless, we’ll continue to explain why we think a shake-up is overdue. In prior posts, we demonstrated the risks of Keynesian fiscal policies using 200 years of government budget balances and 63 high debt episodes, and by working through the implausible arithmetic in Krugman’s debt reduction formula. More recently, we argued the Austrian/Minskyite position that bank lending is riskier than lending funded by prior savings, and also discussed many economists’ ignorance of the way that bank lending works. We’ll tie the last two points together here, by taking a closer look at what happens when credit growth disconnects from naturally occurring (not through bank money creation) or “prior” savings. The earlier savings rates don’t match NIPA exactly because: 1) they’re calculated from different surveys, and 2) they ignore personal interest and transfer payments, skewing the figures higher than they should be. 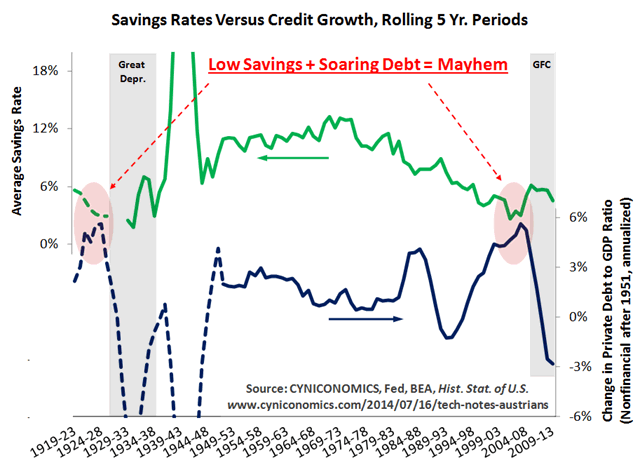 In any case, true savings rates were surely low during the late 1920s – when both consumer credit and durable goods purchases were in bubble mode – and quite possibly even lower than the data in the chart. Although there are only two episodes combining low savings with rapid credit growth, the outcomes couldn’t be clearer. Lending from domestic, “non-money” savings (essentially prior savings). 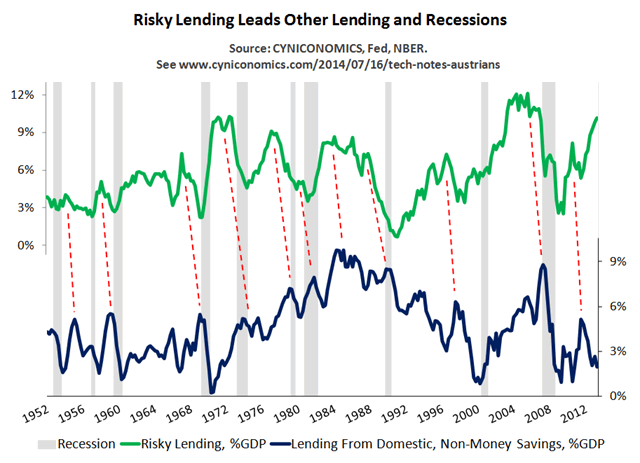 Risky lending tends to peak before lending from domestic, non-money savings, and also before recessions. In other words, once risky lending maxes out, the ensuing weakness feeds into the broader economy. Moreover, the earlier chart running from the Great Depression to the global financial crisis adds a giant exclamation point to the post-WW2 results. It seems clear that risky lending is a key driver of the business cycle, while extreme differences between lending and savings lead to fully-fledged busts. Needless to say, our conclusions aren’t exactly mainstream when it comes to economic theory. There’s no place in mainstream models for the idea that money-creating bank lending is any different to lending from prior savings. Nor is there a place for other fundamental features of credit booms, such as the malinvestment that deepens recessions or balance sheets that are unsustainably swollen with debt. Mainstream models don’t include balance sheets, after effects of malinvestment or even the very existence of banks! To take the most basic steps towards understanding booms and busts, you need to venture outside the mainstream. The Austrian school, in particular, stresses key differences between money creation and lending from prior savings, matching the real world results in the charts above. If you happen to show this post to your favorite Austrian economist, we wouldn’t be surprised if you’re told it’s too empirical. The Austrian school’s distrust of empirical research is well-defended by our friend Detlev Schlichter here, and we don’t completely disagree with him. But we do believe that many ideas in economics are reasonably refuted by observing real world happenings, while others are reasonably validated (though never proven). At least that’s how we see it, as you may have guessed from our content. Think of the show Mythbusters, where all kinds of theories, rumors, adages, movie scenes and more are tested through experiments. While the experiments are often inconclusive, they’re informative enough for the presenters to make a judgment call – is the myth “busted” or not? We take essentially the same approach. Our experiments can’t be controlled, for obvious reasons, and this is the greatest limitation to empirical research in economics. Nonetheless, it shouldn’t prevent us from gleaning whatever information we can from history, and then considering what it tells us about the accuracy of economic theory. Even Murray Rothbard, we might add in closing, made the occasional empirical argument.